Match gems and win battles in this fantasy inspired puzzler. Most times, lightning doesn't strike twice. Just because a company created something bold and innovative doesn't mean that it can produce the same amount of success for another publisher. Take Infinite Interactive, the creators behind the smash hit game, Puzzle Quest: Challenge of the Warlords. The company's latest effort, Puzzle Chronicles for PSP, takes place in the same medieval era as Quest, but works with an entirely new interface. This time around, you battle using a system involving multi-colored gems, skull icons and counter gems; think Super Puzzle Fighter II Turbo, but with the pieces coming in from the side instead of the top. You use the gems and counter gems of the same color to eliminate them from the screen. Along the way, if you manage to hit skull icons, you damage your opponent, who you fight in real time on the top half of the screen. The story will hold your interest, but the main hero is a laughable bozo. He's just a Conan wanna-be freed from captivity by a strange sorceress and sent to fix a world gone wrong. Along the way, he acquires spells and a hellhound with the ability to boost his rage (thus improving your odds to win a match). For the most part, though, it's a matter of moving around on the overhead map to the next fight, matching gems and hacking your opponent until he or she collapses in defeat. The in-game story is told through crude comic book-style sequences, but they really could've used something to spruce them up, such as animation or CG. 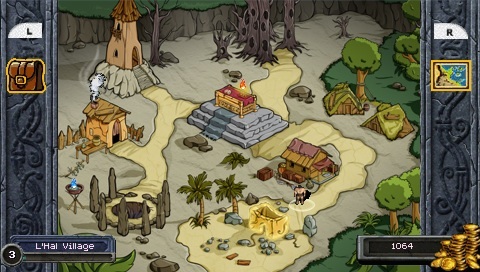 Although the gameplay isn't on the same level as Puzzle Quest, the game has its good points. It is fun to play once you get into it, and the mixed-up bonus rounds, where you match up four gems or more to remove them from a constantly stacked playfield, are cool. Furthermore, you can challenge a friend via local AdHoc play, and the versus matches are not only fun, but also interesting to watch. No, Puzzle Chronicles isn't a must-have in the same league as Puzzle Quest, but if you want a different kind of puzzle experience and don't mind putting up with a story similar to Red Sonja, feel free to splurge. 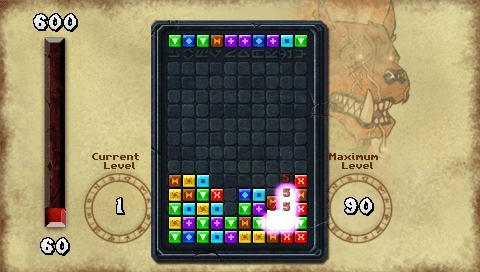 What's Hot: Decent puzzle-based gameplay, good soundtrack, solid multiplayer. What's Not: Puzzle system doesn't work as smoothly as in Puzzle Quest, lead character is a laughable Conan rip-off, story sequences could've used something extra.